(a) The operation distance changes according to how customers hold the transmitter or where it is used. (b) Because of using the very weak radio wave, if there is a strong wave or noise on the frequency being used, the operation distance may become shorter. (a) Stand on the driver's side. Stay 1 m away from the vehicle. (b) Turn the transmitter toward the vehicle and press any one of the transmission switched for 1 sec. (a) Start up diagnosis mode. HINT: Follow the method below. Remove the ignition key from the ignition key cylinder. Insert the key into the ignition switch. Turn the ignition switch ON once within 5 sec. Repeat turnning the ignition switch OFF " ON 9 times within 30 sec. Enter the diagnosis mode, and make sure that the taillight lights up. (b) Finishing the Diagnosis Mode. During the Diagnosis mode, turn the ignition switch OFF " ON to go back to the normal mode. At this time make sure that the taillight lights up. HINT: Check how the taillight lights up when pressing each transmitter switch. Disagreement of recognition code or rolling code. HINT: If (4) is detected in the Diagnosis Check, conduct the recognition code registration. No response from the taillight. HINT: Conduct the following checks. 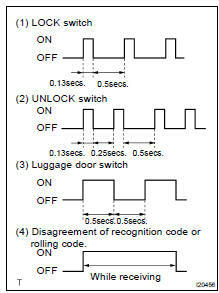 HINT: Refer to "Wireless door lock control receiver and transmitter replacement". (a) Using a screwdriver, remove the screw and cover. (b) Remove the battery (lithium battery). (c) Install a new or normal battery (lithium battery). HINT: When a new or normal battery can not be obtained, connect 2 new 1.5 V batteries in series, connect the battery (+) to the battery receptacle side terminal and battery (-) to the bottom terminal, then apply 3 V voltage to the transmitter. (d) In the location where is approx. 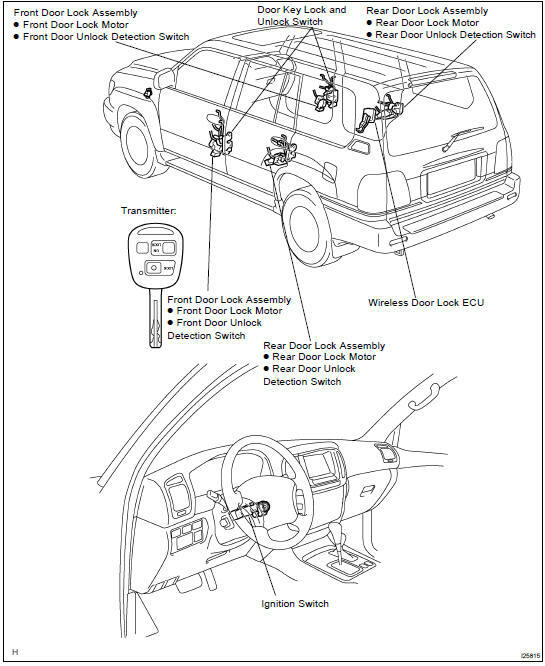 1 M away from driver's outside handle in the right direction, face the key plate of the transmitter to the vehicle, and check the transmitter operation when pressing transmission switch on the side of the transmitter body. (e) Install the battery (lithium battery). (f) Install a cover so that O-ring is not distorted or slipped off. (g) Using a screwdriver, tighten the screw. Remote control of vehicle door lock can be operated. LED lights up more than once. The minimum operation distance differs according to operator, the way of holding, and location. As weak wave is used, operation distance might be shortened when noise is detected in strong wave or used frequency. Make sure to use the TOYOTA electrical tester. With the battery unloaded, judge can not be made whether the battery is available or not on the test. When the transmitter is faulty, the energy amount left in the battery might not be checked correctly. On the lithium battery used for the transmitter, the voltage more than 2.5 V with the battery unloaded is shown on the tester until the energy is completely consumed. Accordingly when inspecting the energy amount left in the battery, it is necessary to measure the voltage when the battery is loaded. (1.2 kW). (a) Remove the 2 screws and cover using a (-) driver. (b) Remove the battery (lithium battery) from the transmitter. (d) Connect the (+) tester to the (+) battery (lithium battery), and (-) tester to the lead respectively. (e) Press one of the transmitting switches on the transmitter for approx. 1 second. (f) Press the transmitting switch on the transmitter again to check the voltage. When the temperature of the battery is low, the judge can not be made correctly. When the outcome of the test is less than 2.1 V, conduct the test again after leaving the battery in the place at 18 C for more than 30 minutes. By auto power off function, the voltage becomes no load voltage (more than 2.5 V) condition 20 seconds after the switch was pressed. Make sure to read the voltage before of it. High voltage might be shown 1 to 2 times after leaving the battery, judge should be made with the voltage shown at the 3rd time or later. (h) Set the battery (lithium battery) in the transmitter. (i) Install the cover, so that the O-ring is not distorted or slipped off. Disconnect the connector from the tuner and inspect the connector on the wire harness side, as shown. If the circuit is not as specified, inspect the circuit connected to other parts.